Daria just hit me with the car, killing me, even though she was supposed to be on my team. It was an honest mistake, as this was one of her first games—she’s learning quick though. This type of incident seems to fit the motif perfectly; the scared nerdy girl who isn’t great behind the wheel to begin with mashes the pedal out of fear and takes out her friend instead. We laughed about it afterwards, but the loss of XP for not escaping was a fresh wound at the time. Then it happened again. It wasn’t Daria this time, but someone else on our team, another girl who, when the incident initially happened, seemed apologetic and was laughing for a moment like we had been, but then I realized her tone had changed. Someone reminded her that I had been playing Vanessa Jones, the female black counselor, who I prefer playing as due to her enhanced stamina and speed. The generic athletic girl quickly came under fire for her race and the other player’s tone changed, saying that she couldn’t see me because of her skin color, and now she was glad they didn’t let me in the car and even hit me. Other than racism being alive and well in the community, there is also a large problem with team-killing. 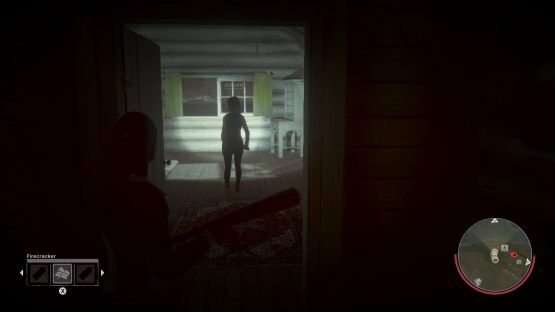 Griefing is a big problem for the people who want to play Friday the 13th: The Game the way it was intended. This is a title that requires players to work together, at least to some extent if they want to survive the match. It’s considerably harder for a single person to escape on their own without completely repairing one of the vehicles or being lucky enough to find the fuse and live through the installation process. Trekking to the fuse house and installing it without succumbing to Jason’s attacks or traps is a feat if others aren’t keeping him occupied. 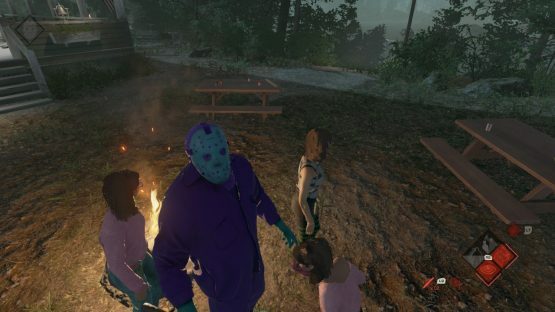 Every Jason player traps the fuse box, even me. As the items are spread out and sometimes escaping counselors take key objects with them, the odds are stacked against a lone wolf. Now throw in that other element of fear, what people claim is the scariest part of any apocalyptic situation: other humans. I get it, but I’m here to enjoy the game and not to be a part of someone else’s murder masterpiece fantasy or twisted jollies, except Jason’s. As I play so much though—one hundred and ten hours logged already—I run into this very often. Tonight, someone in our chat accused one of my teammates of team-killing in the last round. Not only did he not do it, no one had. When this does happen the word ‘betrayed’ is placed next to the name of the victim, and no one had that plastered by their username. He was seemingly trying to start something that would encourage other players to team-kill, so he didn’t have to. The chaos he was looking to cause didn’t catch on, but while we played the next match the troublemaker was pointing his shotgun at another teammate of mine. Thankfully, I was picked to be Jason that round and took care of it. I’m not above team-killing, though I’ve only done it twice on purpose. Both times were a sweet revenge for actions visited upon me or others. There are negatives for doing this, a loss of XP that round. Basically, that player’s character gains almost nothing for the twenty or more minutes they put into the match. That isn’t much now though, as so many have leveled to get everything they wanted, now only slowly unlocking extra clothes for the counselors. Offenders can also simply back out of the match once the deed is done at no penalty, since they wouldn’t have gotten much to level up on anyway, and move on to kill their next teammate and laugh about it. It’s a real problem, not one that completely kills the game, but it was certainly hurting it for anyone who wanted to play as intended. That’s why the developers have decided to change this element of the gameplay after a slew of negative feedback, making it where only vehicles and traps can kill other players now. The reactions to this have had quite the range, with some people being pleased and others legit pissed, claiming that it takes away their fun. Personally, I think it means the assholes will have to work harder for their petty pleasures. If they play in a large group like I do, someone could always just tell Jason where the other players are or open doors for him as well—come on, we’ve all done it—but there is still a fighting chance. As much as I appreciate them addressing this problem directly, it feels like a secondary issue when the game still has so many other problems. I worry more about dying because any important items I’m carrying won’t be able to be used by my teammates because they glitched into the floor. This seems like a quick fix though, so hopefully those things are still being worked on (please!). At least they’re adding emotes I guess? I do have to play devil’s advocate for a moment though—I’m pretty good at that—and point out that the prospect of team-killing can add to the horror, when it makes sense. We have had a couple of laughs from it, when there wasn’t such vitriol and senselessness behind it. People are going to be assholes, but maybe a better punishment would have balanced this problem out without having to bring the hammer down. I’m thinking something like a time out, where betrayers couldn’t join a game for ten minutes for example, kept in check by a voting system so that at least half the players would have to agree to the eviction. IllFonic’s way might be simpler though. For those that are upset about this change, or just want to keep partner killing as a part of their brand of “fun,” it won’t affect private matches. The developers believe this new approach will help, and I play with several people who are rejoicing, so that’s hard to argue. I’m sure I will still stumble into a few well-placed traps by conniving mischief makers that will irk me and find more people glitching out of matches, but as long as they continue to add good content and I have friends to play with, I’ll keep working my way to two hundred hours spent inside Friday the 13th: The Game.